Oesophageal cancer is a cancer of the food pipe. Around 8,900 people are diagnosed with this each year in the UK. There are two main types of cancer of the oesophagus – adenocarcinoma and squamous cell carcinoma. All cancers of the oesophagus and of the junction of the stomach are often at an advanced stage by the time they are diagnosed, so treatment outcomes are poor. However, some patients with a condition called Barrett’s oesophagus – where the cells lining the base of the oesophagus are modified – go on to develop oesophageal adenocarcinoma. Researchers in Cambridge are making breakthroughs in detecting which patients with Barrett’s oesophagus are at risk of developing this cancer. The main treatments for oesophageal cancer are surgery, radiotherapy, chemotherapy or chemoradiotherapy. Treatment depends on where in the oesophagus the cancer is, how far it has grown or spread, type of cell, the grade and general health and fitness level. The treatment outcome varies slightly for the different types of oesophageal cancer. In terms of squamous call carcinomas about 75% survive for 1 year or more after diagnosis, 50% will survive for 2 years or more and 40% survive 3 years or more after diagnosis. In people with adenocarcinoma, 80% will survive for 1 year or more, 60% will survive for 2 years or more and 50% survive for 3 years or more. If the cancer has spread to the lymph nodes 21% live for 5 years or more after diagnosis. For advanced oesophageal cancer around 4% will live for 5 years or more. Survival rates in cancer are directly related to the degree of disease spread at the time of diagnosis. Cancer can become advanced before any symptoms are manifest. Oesophageal cancer is a prime example of this problem. 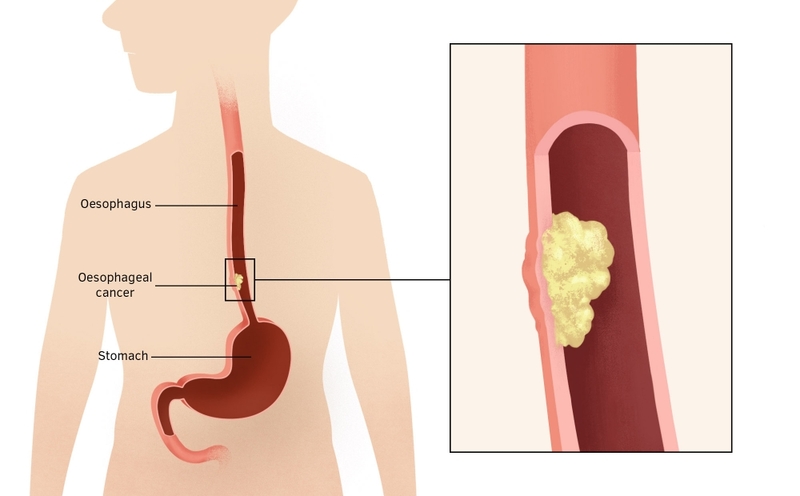 We have developed a screening test for Barrett’s oesophagus which comprises a device, CytospongeTM, coupled to a molecular marker, which is a much less invasive and cost-effective alternative to endoscopy. In collaboration with our primary care colleagues we performed a study of approximately 500 individuals which highlighted the potential utility of this approach. Development of a micro-simulation model showed that the CytospongeTM biomarker test, followed by endoscopic based treatments such as radiofrequency ablation for high-risk patients could be cost-effective when compared with the current endoscopic method for diagnosis and surveillance. This was done in collaboration with colleagues from the Department of Public Health and Primary Care (DPHP) and the MRC Biostatistics Unit. Ongoing work includes studies evaluating the acceptability and effects on quality of life of those treated in this way compared with endoscopy (collaboration with Fiona Walter, DPHP). The Cancer Research UK (CRUK) funded multi-centre BEST2 study of over 1,000 individuals is well underway to test this approach further. This trial has established docetaxel as the second line standard of care for patients with advanced oesophageal and stomach cancers. The protocol for this trial is available here: COUGAR-02 trial protocol. The trial results were published online on 10 December 2013 in Lancet Oncology. Our researchers have found a clinical application for the use of fluorescently-labelled lectins during endoscopic visualisation of pre-cancerous areas in Barrett’s oesophagus.